Me: I think I'm going to try and find new curtains for the kitchen. Spouse: Why don't you see if Tammy wants to go? Me: I don't think that's a good idea - she likes to shop. My best friend Tammy has the patience of a saint when it comes to one (but really, more than one) particular aspect of our relationship. She understands and accepts me for who I am and who I am not. 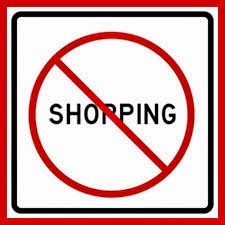 When it comes to shopping, my normal rule of thumb is to shop by myself because I hate the whole process, so it is no pleasure cruise for anyone that is forced to join me. When I drag Tammy along with me to shop, she is aware that I have a hard time with investing the necessary time to enter more than one store and sift through various styles for what I want. I get tired, impatient, cranky, and thirsty. Fortunately, since we live in New England, there is almost always a Dunkin Donuts within a half-mile radius. The weekend after Christmas was no exception. I wanted to see my BF and I wanted new kitchen curtains. This meant my not-so-lucky buddy was forced to witness my lack of commitment as well as my ignorance in choosing colors that complement the kitchen. Of course, it’s hard to complement mismatched cabinets and sheetrock that the cat has taken a chunk out of for some inexplicable reason. I started out positive, venturing into an actual curtain shop. That’s where they sell nothing but curtains and the accessories that make them stand out. Truth be told, I did admire a couple of curtain sets but my purse somehow locked itself shut with one look at the prices. Tammy smiled in understanding and suggested a nearby department store with after-Christmas sales. 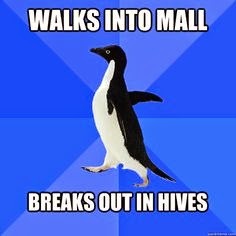 Few things strike fear in my heart the way a visit to the mall does. This is the ultimate shopping sentence for someone like me who prefers a place with a quick getaway that doesn’t spill out into a whole world of retail. I went along with the idea, determined to strut into the mall department store, find exactly what I want and swoop back out with Tammy in tow before she even saw the white sale. As expected, the choices were lacking there, and that store was nowhere near another mall establishment that might have curtains, thankfully. However, my BF turned me on to a gorgeous comforter – another item on my this-really-needs-to-be-replaced list. After waiting in line behind someone returning what was probably a duplicate set of Frozen sheet sets, I approached the nice Mall Department Store Sales Lady and asked if they had the right color and size in stock. Records showed they did not but that it may still be available when it was restocked. That meant coming back to the mall. I’m thinking being warm is overrated. Off we drove to another town and another department store, which, it turns out, did not carry curtains. That was fine with me because I could see more than one escape route and for reasons I can’t quite define, I happen to like this particular store. Besides, the lack of curtains left me with spending money for a new purse. I know, I know – this was breaking my own not-browsing rule, but on occasion I can sniff out a good bargain, and the best part of this purchase was that I didn’t have to try it on. It’s a wonderful thing to have a best friend who will deal with my idiosyncrasies… and who knows never to give me a gift certificate to the mall.